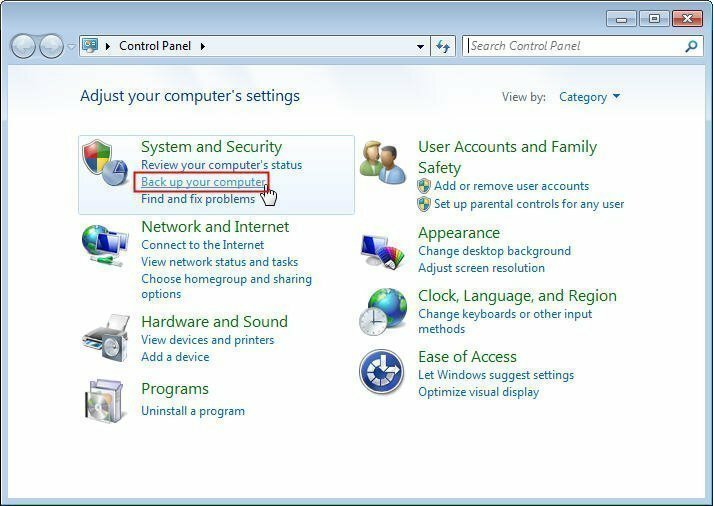 To do incremental backup in Windows 7 is popular among computer users. Incremental backup can help to improve Windows 7 backup efficiency and reduce storage disk space required by the image file. Incremental backup refers to a backup in which data objects modified since the last full backup or incremental backup. In another word, an incremental backup will only back up the changed data based on the last full backup. 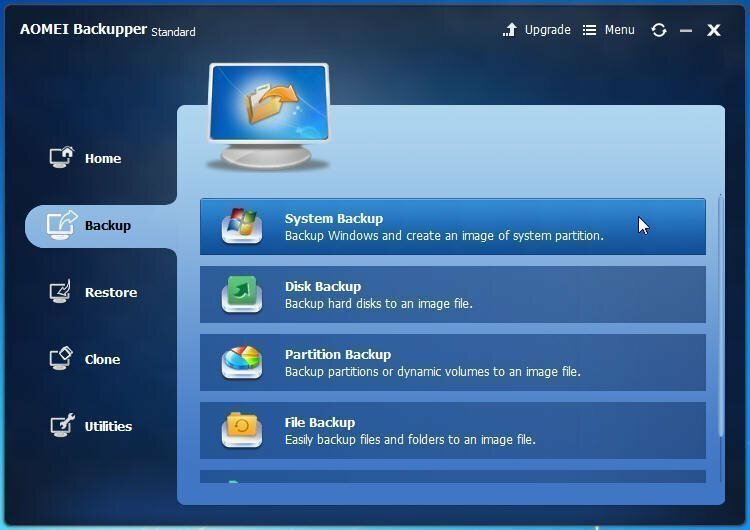 It is similar to Windows 7 differential backup, which will back up the changed files since the full backup. The advantage of an Incremental backup is that it saves disk space and running time while keeps all the files backed up. However, it does have some disadvantages. Since every incremental backup is based on the last backup, if one of the incremental backups gets lost, you will lose all the backups after that incremental backup. When you come to restore the backup performed as incremental backup, it will take more time since it needs to use all the incremental backups and the original full backup. 1. Open the Windows backup tool. You can find it under System and Security in Control Panel. 2. Click “Set up backup“ to get started. 3. Choose where to save the image backup. 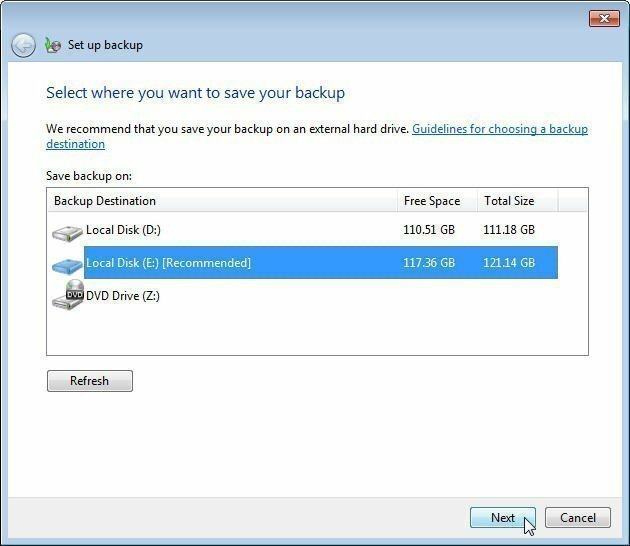 Windows 7 incremental backup to NAS is also supported. 4. 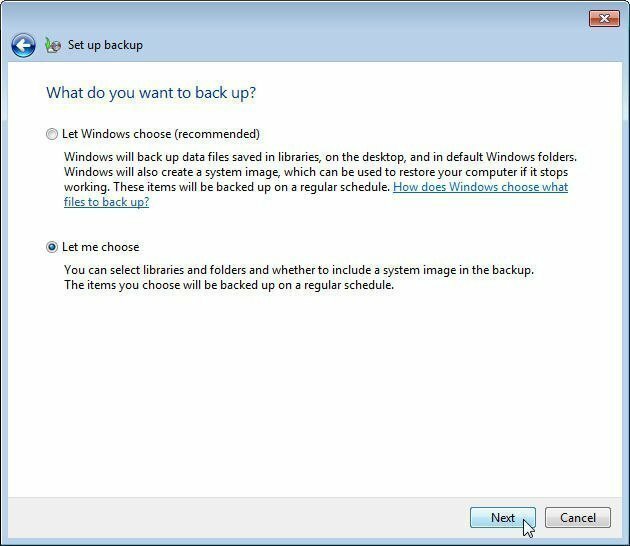 Choose what to backup by selecting “Let Windows choose” or “Let me choose” to create a custom backup. 5. If you want to include files in the backup yourself. You can select the checkbox of the files in the next screen. 6. By default, it will set a schedule at 7:00 PM every Sunday to run the backup. You can click “Change schedule” to modify it according to your needs. If you do not want to change, just click “Save settings and run backup” to start the backup. 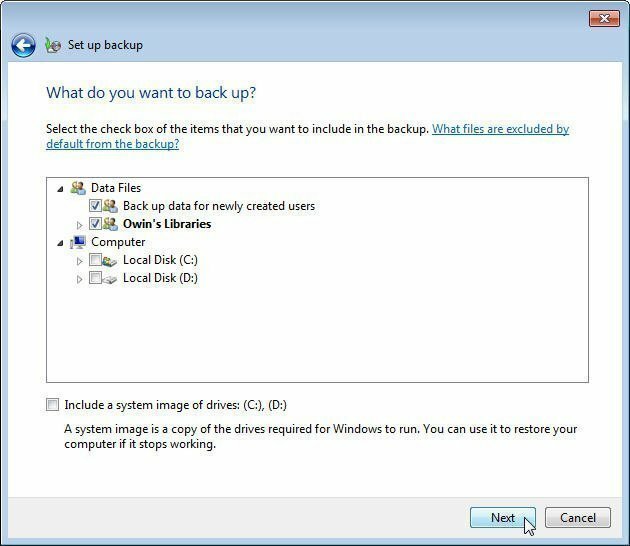 Besides this method, you can also use WBadmin enable backup command to create incremental backups from a command prompt. 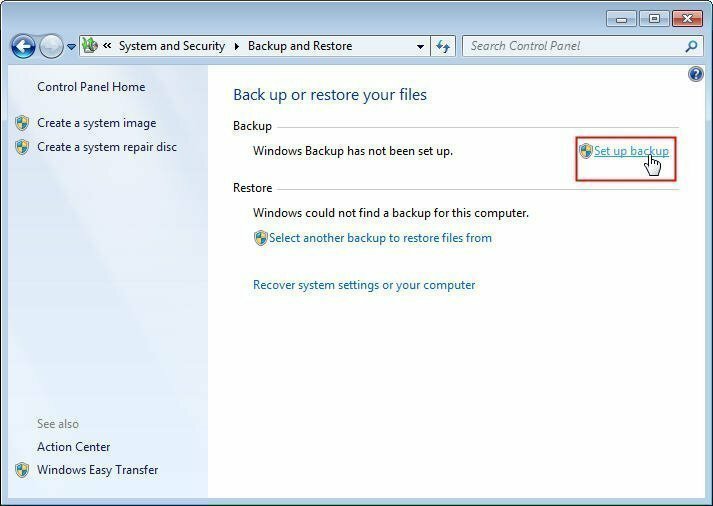 Microsoft does not want users to get messed up with full backup and incremental backup, so Windows 7 backup will perform incremental backup by default. There is a way to change whether to perform a full backup or incremental backup in Registry, which is not confirmed by Microsoft. Therefore, it is not recommended to modify it. If detecting insufficient space on the backup drive for the next backup, it will delete the previous backups and create a full backup. However, if some error occurs during creating the new full backup, you will end up with no backup at all. That said, Windows 7 Backup and Restore incremental backups are not completely safe. If you want to be able to perform incremental backup more flexible, you can use free backup software. 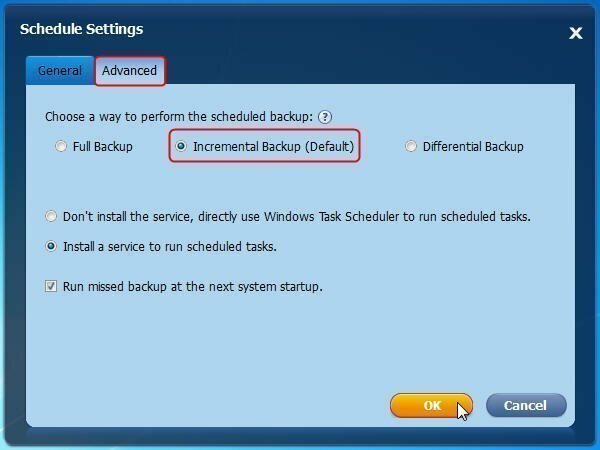 How to do Windows 7 incremental backup? 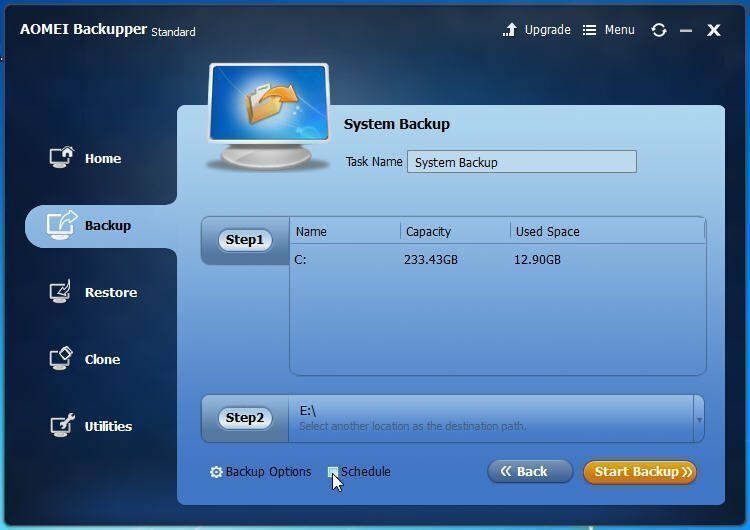 As Windows 7 incremental backup software, AOMEI Backupper has been one perfect choice for computer users to do scheduled backup or one-time backup job. Besides incremental backup, it allows you to perform differential backup or full backup as scheduled. Step 1: Download, install and launch this freeware. Step 2: Click “Backup", and select one type of backup you need. Let's take system backup as an example. Step 3: in the next screen, all files needed for a system restore have already been included in “Step 1”, so click “Step 2” to select a destination path. Step 4: Set a specific time to run a backup by clicking the “Schedule” button. Under Advance tab, the incremental backup is already selected by default, and of course, you can modify it there. Step 5: Click “Start Backup” to run the backup as scheduled. 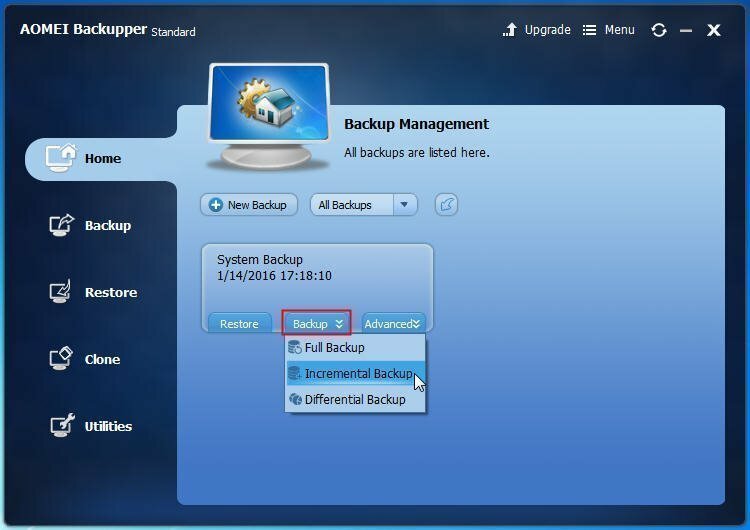 If you have created a backup, you can also perform a one-time incremental backup. Locate the backup at Home screen, and then go to Backup → Incremental Backup to perform an incremental backup. During the whole backing up process, this program will not interrupt you from your work. Apart from Windows 7 incremental backup, you can also use AOMEI Backupper for cloning hard drive to SSD, file sync, and more.